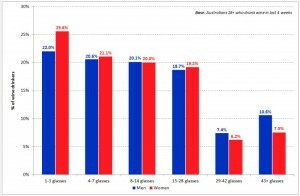 More Australians are drinking wine then beer and it is because of women’s taste for wine says the latest data from Roy Morgan Research. According to the study, 45.1 per cent of adult Australians drank wine at least once a month in 2015. Only 37.6 per cent drank beer monthly, making wine the nation’s favourite alcoholic beverage. Roy Morgan Research says wine’s top spot position is attributed to 4.6 million Australian women 18+, or 49 per cent of the adult female population, drinking wine each month in 2015. Comparatively, only 3.7 million of men, or 41 per cent of the male population, consumed wine. What type of wine is most popular? Roy Morgan Research says in 2015 white was the most popular wine for women with 69 per cent of women wine drinkers choosing it. Approximately 56 per cent of all female winer drinkers consumed red, 42 percent sparkling and 9 per cent fortified. The research also revealed that 18.4 per cent of all female wine drinkers consume a mix of white, red and sparkling within any given four-week period. Source: Roy Morgan Single Source (Australia), October 2014 – September 2015 (n=7,621). 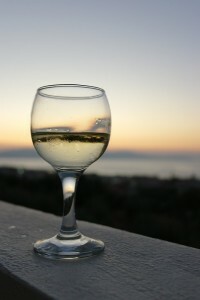 Male wine drinkers are more likely to drink red wine with 78.1 per cent choosing the beverage. Just 58.4 per cent chose white, 24.6 per cent sparkling and 15.4 per cent fortified. 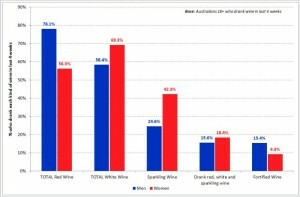 Men who drink a combination of white, red and sparkling account for 15.6 per cent of male wine drinkers. Although women far outnumber men when it comes to wine-drinking incidence, the volume each gender consumes is fairly similar. Two-thirds of female wine drinkers and nearly 63 per cent of their male counterparts report consuming less than 15 glasses of wine per four weeks. General Manager for Consumer Products at Roy Morgan Research, Andrew Price, said it was clear that Australian women enjoy their wine. “While the proportion of women who drink wine has fallen slightly over the last decade, from 51 per cent to 49 per cent, the decrease in male wine drinkers has been much more marked, from 48.1 per cent to 41.2 per cent,” Price said. “Beer remains the clear favourite among Aussie men, consumed by 58.1 per cent of them in any given four weeks,” he stated. “There is frequently a social dimension to Aussie women’s wine-drinking: over 45 per cent consume it in a licensed venue, for example a bar, pub, restaurant or festival, and nearly 41% drink it at friends’/relatives’ homes. In contrast, 34.6 per cent of male wine-drinkers consume it ‘on premises’, and 32.5 per cent do so at friends’/relatives’ homes,” said Price.